Medusa is a marble sculpture by the Italian artist, Gian Lorenzo Bernini. It is not known exactly when it was sculpted, although a date in the 1630s is usually suggested. It portrays the head and shoulders of a monstrous, snake-haired woman with a petrifying glare: Medusa, from classical mythology. The sculpture is now in the care of the Capitoline Museums. A notable feature of Bernini’s sculpture is that, unusually for this subject, Medusa is shown as alive and monstrous, rather than, as many other artists represented her, as a defeated figure with her head cut off. 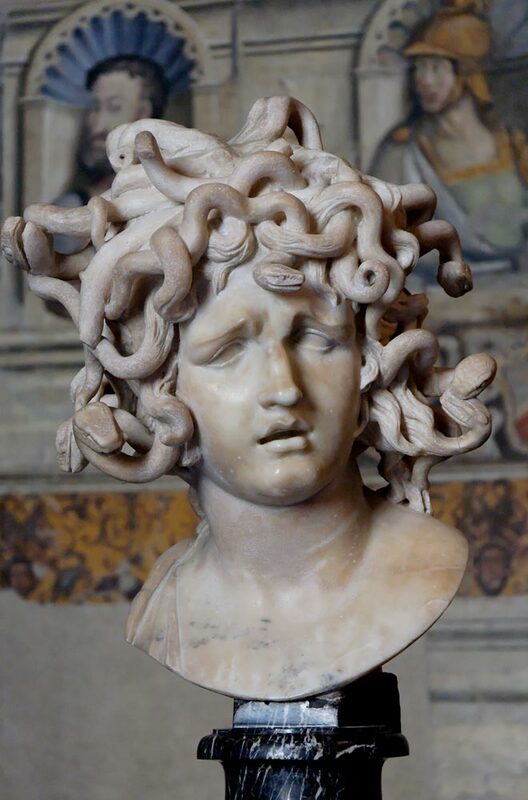 Some authorities have suggested that Bernini chose this representation deliberately, playing on the fact that in sculpted form, Medusa has herself been turned to stone. Most of the sculpture displays a precise, sensual quality that is characteristic of Bernini’s work. In particular, there is a strong sense that Medusa, while certainly a monster, is an intelligent and lively one rather than a simple beast. However, parts of the face are rather exaggerated, which has led to speculation that they were sculpted by someone other than Bernini himself.